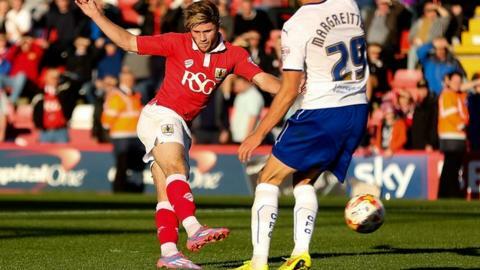 Wes Burns' injury-time strike gave top-of-the-table Bristol City a dramatic win over Chesterfield in League One. The Robins went ahead through Ian Evatt's own goal, before Eoin Doyle equalised from the penalty spot after he was fouled by Derrick Williams. Williams atoned for his error by heading in Luke Freeman's corner, but Doyle's tap-in pegged City back again. But Burns, on as a first-half substitute, smashed a half-volley into the corner to win it for the home side. The result means unbeaten City stretched their lead at the top of the table to five points, having won eight and drawn four of their opening 12 matches - their last league defeat coming in March. Chesterfield remain in sixth, meanwhile, with Doyle's 14 league strikes accounting for two thirds of the Spireites' goals so far this term. "I think we had the better chances in the game and if we were ruthless enough, it could have been five. "But Chesterfield had some good possession and played some good football, let's not take that away from them. "I was delighted that Wes Burns got the winner because he made the mistake for the second goal. "Two of our younger players were punished by giving the ball away in the final third, bless them - but that's what happens." Match ends, Bristol City 3, Chesterfield 2. Second Half ends, Bristol City 3, Chesterfield 2. Attempt missed. Sam Morsy (Chesterfield) right footed shot from more than 35 yards is close, but misses to the left. Goal! Bristol City 3, Chesterfield 2. Wes Burns (Bristol City) right footed shot from the centre of the box to the high centre of the goal. Assisted by Wade Elliott. Attempt blocked. Jay O'Shea (Chesterfield) right footed shot from outside the box is blocked. Attempt missed. Mark Little (Bristol City) right footed shot from outside the box is close, but misses to the left. Substitution, Bristol City. Jay Emmanuel-Thomas replaces Luke Freeman. Jay O'Shea (Chesterfield) wins a free kick in the defensive half. Attempt missed. Eoin Doyle (Chesterfield) header from the left side of the six yard box is close, but misses to the left. Substitution, Bristol City. Marlon Pack replaces Kieran Agard. Substitution, Chesterfield. Jay O'Shea replaces Jimmy Ryan. Attempt missed. Wes Burns (Bristol City) header from the left side of the six yard box is just a bit too high. Foul by Georg Margreitter (Chesterfield). Attempt saved. Oliver Banks (Chesterfield) right footed shot from the centre of the box is saved in the bottom right corner. Aaron Wilbraham (Bristol City) wins a free kick on the left wing. Attempt missed. Jimmy Ryan (Chesterfield) right footed shot from outside the box is too high. Substitution, Chesterfield. Romuald Boco replaces Daniel Johnson. Luke Freeman (Bristol City) hits the bar with a left footed shot from outside the box. Attempt blocked. Kieran Agard (Bristol City) right footed shot from the centre of the box is blocked. Corner, Bristol City. Conceded by Tendayi Darikwa. Goal! Bristol City 2, Chesterfield 2. Eoin Doyle (Chesterfield) right footed shot from very close range to the bottom left corner. Assisted by Sam Clucas. Luke Ayling (Bristol City) wins a free kick on the left wing. Corner, Chesterfield. Conceded by Mark Little.